At the risk of butchering Lord Tennyson’s romantic sentiment, I will paraphrase it like so: “In the spring an old lady’s fancy bombastically turns to thoughts of horse racing. It is, after all, Kentucky Derby week. I’ve been crazy about the Derby since I was a mere stripling. But more about those good ol’ days later. The Kentucky Derby is as much about hats as it is the “fastest two minutes in sports,” as the news pundits put it. I love to watch the pre-race activities to see the hats and the stables where the horses peer out from their stalls. They obviously don’t know or care which of them will wear the roses and will become famous just after those two minutes. Right now, California Chrome is the favorite. But who knows? I carefully study the horses and pick my own favorite. It’s actually a two-day event for me. The Kentucky Oaks is on Friday just before the third Saturday in May. It’s for fillies only, and it’s almost as exciting as the Derby. I love hats. Some of the hats I see on ladies strolling through Churchill Downs are intentionally silly and fun, but I’m partial to the truly beautiful hats. Come to think of it, I suppose that’s subjective. My favorite hats are those auctioned off in that most unique of Derby events, “Hats Off to the Horses: The Road to the Derby.” The hats are sponsored by Maggie Mae Designs and are designed by Sally Faith Steinmann. The woman is a genius. 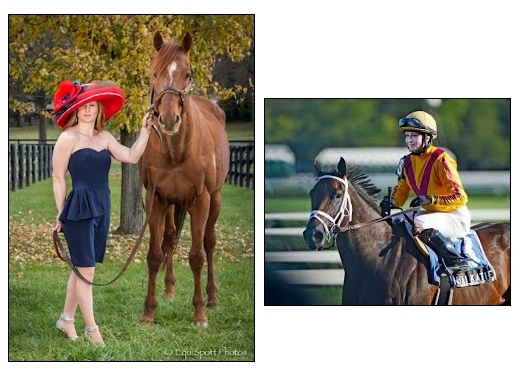 Each hat is inspired by a thoroughbred at Old Friends. It’s a charity event that benefits one of my all-time favorite places to visit: Old Friends Thoroughbred Retirement Farm. [See Links Page] in Lexington, Kentucky. I know many of the horses retired there, mostly by reputation. It’s a special thrill for me to reach over the fence and pet one of my many horse heroes. Another of my heroes, who is very active in the race horse business is Rosie Napravnik, one of the few female jockeys working today. Rosie distinguishes herself every time she races. She is pictured wearing several of the hats in the portfolio of auction hats on the Old Friends web site. Now, hold on. I didn’t forget. I promised you a good ol’ days story. Citation poses for the camera. He was a beautiful bay. My favorite Kentucky Derby winner as well as Triple Crown champion was Citation. He was three – all Derby horses are three — and I was 11 years old. It was 1948, and the Derby was to be on the upcoming Saturday. I was wildly excited about it, so I was horrified when Mother announced that my sister and I were invited to Patricia Murphy’s birthday party on Saturday. When I told her I couldn’t possibly go, she further indicated attendance at the party was mandatory. Saturday came and because Mother was never one to suffer rebellion, I kept my disappointment to myself. I also made secret plans that I dared to hope would work out. The party was indoors, and the house was full of both kids and grownups milling about. Mind you, there was no TV in 1948. I searched the house for a portable radio, but found none. In a corner of the living room there was a huge floor-model radio. I was happy to discover the Derby’s call to the post time coincided with the time for the opening of presents, which were stacked on the dining room table. I figured I could easily sneak away when no one would notice. Feeling both confident and hesitant, I silently sidled up to the radio, and selected the station on which I knew the race would be broadcast. No one was aware I had left the celebrants. It was almost time for the Derby when the birthday girl, Patricia, decided the presents should be piled on the coffee table and the overflow on the floor. She would open them while seated on the sofa as everyone watched. That made things a little iffy. Their backs would be turned to me, but I ran the risk of them hearing the radio. I positioned myself with my back to the radio and a hand behind me grasping the knob. I would wait till there was a loud exclamation about the presents, and then I would turn the knob to a barely discernible volume. Suddenly, everyone decided to sit on the floor, which would leave me standing at the edge of the crowd. Why did it have to be this hard? Didn’t these idiots know it was time for the Derby? I had to go for broke. I waited for a shout of delirious astonishment over the unbelievable present, then I slid down to the floor, and as I did so, I quickly turned the knob to what I thought would be super low. No one seemed to hear. So far so good! Leaning against the radio, my ear on the speaker, I listened to the race. I held my breath as Citation came from behind to win. There was an immediate silence. Not a sound. All eyes were on me. I looked at Mother. She was staring daggers. I sat down and waited for the din to resume, which it did after what seemed like hours. On the way home Mother delivered a stern lecture about being unfriendly and rude, not to mention my unrelenting determination and sneaky behavior. 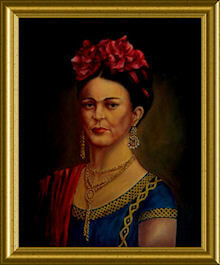 I was to call Patricia and apologize for my unseemly actions. In addition, I would write a heartfelt note of apology to her mother. I knew I had it coming, but to this day I consider it a small price to pay to hear Citation win the Derby. People who know about horse racing named him the third best horse of the 20th century. 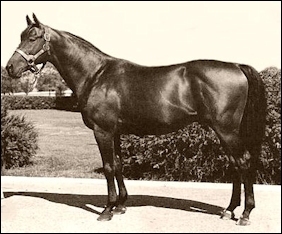 Man ‘o’ War is first and Secretariat second. But Citation will always be first in my heart. I’ll never forget him. I can relate. If you are as old as I am you know that time zips by so fast it takes your breath away. If you’re not as old as I am, take my advice: don’t blink. You won’t recognize your world when you open your eyes again. But, thank goodness, I got over it. I finally stopped trying to see their sweet baby smiles when I behold their grown-up handsome faces. I still don’t like their music. I still marvel at the activities they take part in, the TV shows they watch, their must-have cell phones that text, take pictures, play music, communicate with satellites, their adoration of Dr. Who, the clothes they wear….ah, the clothes they wear! Nowhere are the changes so eye-popping evident than in the apparel they choose for the prom. The high school in the Ohio town where I live had its prom this weekend. 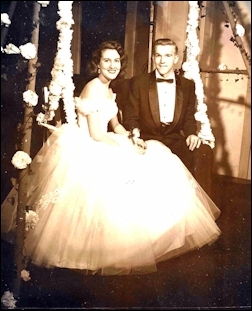 I couldn’t help but think of my own prom at good ol’ East Nashville High in 1954. Wait a minute. Can that really be 60 years ago? Of course “Times Have Changed.” In all that span of time the horse and buggy evolved into the internal combustion engine. I scrounged around and found some pix of my prom days. Please excuse the quality. All I could do is scan the photos of the queen and her court from my annual. I couldn’t find my own prom picture, but a frantic call to my friend, Corinne, in Nashville, turned up a photo of a picture taken of her at her boyfriend’s 1956 prom. Close enough. Corinne can always be counted on. The woman is disgustingly organized. If you should be as old or maybe as southern as I am, you might recognize the bouffant skirts on our dresses. In addition to making us look like we belonged on top of wedding cakes, they were hideously uncomfortable. We selected wide hoops to wear under or over (I forget which) multiple crinoline petticoats. These monstrosities scratched our legs, driving us to distraction. Even worse, if our mothers made us wear hose, they were hanging in shreds from our legs at the close of the evening. Sitting down was impossible. If we were about to pass out from the vapors (we were southern ladies, after all) we had to remember to hike up our hoops in the back before we sat. Forgetting to do so forced the front of the hoop to leap up in front of us, sometimes high enough to expose the equally uncomfortable Merry Widow long-line bra and combination waist cincher. It was seriously boned and gouged us unmercifully wherever the bone tips ended. It is little wonder the girls of today, and probably the girls of long-ago yesterdays got smart and elected to wear much more comfortable and elegant dresses than we wore. There is also a wonderful tendency to aspire to different looks, whereas we elected to wear only pastel tulle and netting in near-identical styles. The boys at East High were also Twinkies. They wore white dinner jackets, tuxedo trousers and black bow ties. I noticed in Corinne’s photo, her boyfriend had on a standard satin lapel tuxedo. 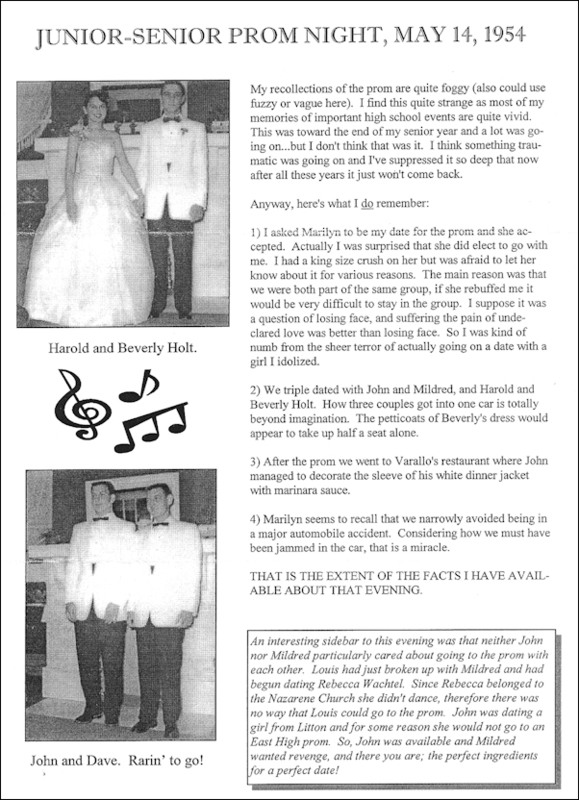 My friend, Dave, sent me a note with pictures about our prom. It’s a more personal viewpoint. I had to scan it and I hope it’s readable. I placed it at the end of this blog. 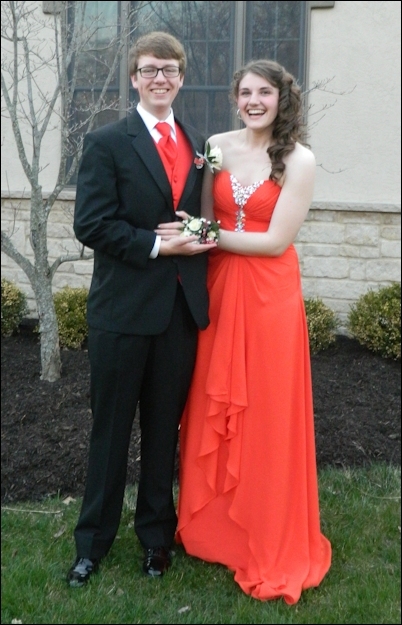 The boys at our 2014 prom wore tuxedos and their accessories were carefully selected to match their dates’ dresses. It’s become the fashion for a few friends to gather at one of their homes to meet and take photos before leaving for the prom. Many families in our town pay for limousines to make the event even more special. I have included some photos of my grandson and his friends all dressed up in way more comfortable, but equally gorgeous prom outfits than my friends wore. 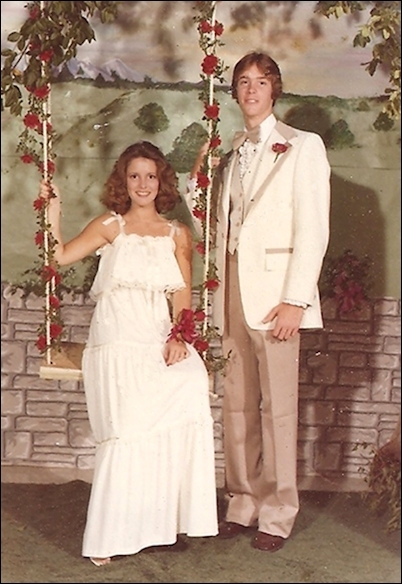 Daughter Mandy and her boyfriend, Steve, at their 1978 prom. Steve wore a “bamboo tux.” The lime green and blue tuxes of the early 70s were calming down by 1978. Both Mandy’s dress and his tux were inspired by Saturday Night Fever. It was disco time! Below is grandson Evan and his girlfriend, Ariel, before their 2014 prom. Ariel is so beautiful. I guess we’ll have to wait a few years before this era is named. The before and after prom activities have also changed. After our proms, we went out to dinner in the most expensive restaurant our dates could afford. Because it was a special night our curfews were set up to 1 am. No curfew the rest of the year was that late. The 2014 activities were very different. After picture-taking, the groups went out to dinner at a nice restaurant, then on to the prom. They danced to a dee jay, whereas we had an orchestra back in the day. After the prom the modern day celebrants went for a casual meal, then to one of the homes to change into their everyday clothes. Or maybe I have the order mixed – never mind. The rest of the night was spent bowling, or watching a movie or just hanging out until they split up: the girls into their slumber party (if that’s what it’s still called) and the boys into theirs. Peace of mind, peace of mind, where’s the happiness we should be having? Maybe it’s not such a sad song after all. Maybe the message is we shouldn’t seek the happiness in our long-gone good times, but in the good times our kids are having and our own good times now and in the future. If you become a regular reader of my posts, you will soon learn of my love for Mexico. This is the story of my ignominious introduction to my favorite place to visit. It was our first visit to Mexico. My husband John and I love trains, and we had decided to drive to Laredo, Texas, walk across the border and take a train into the Mexican interior. The three o’clock train rumbled into the Laredo station, only two hours late. Having read all the guidebooks, I was aware the Mexican people paid little attention to time and schedules, one of the country’s most endearing qualities to my way of thinking. Boarding the sleeper car in which we had reserved a bedroom for the 12-hour trip to Mexico City, I found it wasn’t the bedroom at all. It was a tiny, one-person roomette. “This is a bedroom, Senora,” The porter smiled and nodded toward the other roomettes lining the narrow aisle of the sleeper, all of which were being quickly occupied by Mexican families. John, who was less than enthusiastic about this particular adventure, spoke: “Stop arguing and sit down. There’s no mistake. This is what they’re obviously referring to as a bedroom.” He was right. I gave up. If five Mexicans could sleep on one narrow cot, the two of us could manage as well. After all, we wanted to experience the true essence of the country, and believe me, the essence on that hot, humid, sleeper was overpowering. Pretty soon, I heard band music. Not wishing to miss one Mexican moment, I ran to the little platform on the sleeper to see a student band arranged across the track playing its heart out. I seemed to be the only one impressed by it. Our fellow travelers paid them no mind at all. As I listened to the music, the train suddenly came alive and lurched forward. There being no rail to hang onto, I very nearly fell off the platform. It was the first of many such experiences in my travels There are no safety rules or warning signs anywhere in Mexico. You are totally responsible for the safety of your person. If you fall off the back end of a train, you shouldn’t have been out there in the first place. I bounded from side to side back down the aisle of the swaying train and sat down on the bench in our “bedroom.” It was covered in patched plastic, the stuffing long gone. The journey was to be non-stop to Leon and then an express to Mexico City. We were no sooner off than the train groaned to a stop. “Great! It’s broken down already,” John wailed. But no. After a few seconds it started up. I breathed a sigh of relief just as the train stopped again. After the fifth stop, which occurred in a curve, I discovered the reason. Peering out the grimy window, I saw a man alight from a car up ahead in the curve. His family was waiting for him, standing beside a campfire and an adobe hut. I was amazed to find that our express train stopped to take on and let off individual passengers. We had now experienced at least three surprises. We’re still being surprised by this magical country even after 26 years. We ate our picnic supper, and decided to turn in. There was nothing to see anyway. We soon discovered that was no easy feat. By standing in the aisle and with much tugging and pulling, the berth fell down from its overhead compartment completely covering our other accommodations. Peering down into the toilet before the berth covered it gave me a quick view of the railroad ties as they sped by underneath the train. There was no need for a flushing mechanism. By now it was at least 110 degrees in the sleeper. We clamored into the berth from the aisle. There was no sheet. Back in the aisle we shoved the bunk into its receptacle, pulled our luggage from under the bench and found our largest towel. At least it would be absorbent. The way we were now perspiring, the towel would be soaked in no time. Back on the bunk, we found if we both lay facing the train wall and not bending our knees we wouldn’t touch one another. The bed was about 30 inches wide and about eye level to anyone passing by in the aisle. Fortunately, there was a zippered canvas curtain hiding us from the view of passers-by. I lay there for an hour, unable to sleep and very nearly suffocating in the stifling heat and the dank air. “I’ve got to get these clothes off!” I hissed. I was barely able to peel them off. Although better than sticky clothing, it was precious little relief to wear only my skin. I then found if I bent my body slightly, just enough to poke my posterior over the side of the bunk, I was treated to the merest whisper of air under the canvas curtain. There was a brief pause and then a blood-curdling scream. “Dios Mio!” cried the voice. I flopped over and peered out the curtain just in time to see the young porter dashing up the aisle. Heads began popping out of curtains up and down the sleeper car. Pandemonium reigned as the other passengers tried to identify the source of the pandemonium.